World Vision has mechanised water systems in certain communities of Hamaundu, providing portable water right in their homes. This saves lots of energy and time. Children in Hamaundu now have access to clean drinking water at walkable distances. In the past children used to go late to school due to long distances to fetch water. World Vision has supported the community through construction of the Kanchomba Clinic. Pregnant women now have a safe place to deliver babies and receive professional medical care. Children in Hamaundu community play together during school break time. They interact and are motivated to attend school due to extra currcula activities like play parks and other sporting activities. Children in Hamaundu community have come to learn about God. Bible clubs were formed and children recite memory verses and share poems. Children in Hamaundu community learn about the importance of good hygiene, after they use the toilet. 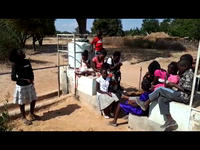 Mary, 10, a member of the Wash-up Club, explains good hygiene practices to her fellow students. “Due to education campaigns, parents are now more eager to take children under 5 to clinics for growth monitoring and immunizations.”– Martha, nurse (standing). “The water was so bad I was sick and could not attend school. Since these wells were constructed, I am healthier and able to attend school more regularly.”– Theresa, 11 years old (second from left). “Before, I was not able to read and write. Then we were provided school supplies and textbooks, and now I enjoy learning.”– Mazuba, 13 years old(front row, second from right). “Since my family learned modern farming techniques, our harvests have improved. I am healthy and doing well in school.”– Mervis, 16 years old (left, holding hoe). Malilwe, aged 14 says, “We are happy to have the knowledge of Savings Groups through World Vision, as children we are also able to get loans and buy for ourselves personal basic needs. This lessened the financial burden on our parents.” Seed project children are now able to form Savings Groups and get loans. “My child is safe from disease because of a clinic for children constructed within walking distance of our home.” Michelo, a parent. “I am thankful for this opportunity to tour the Livingstone Museum. We learned a lot about our country’s history.” Beene, 13 years old. “I am happy with the improved sanitation at my school due to the construction of ventilated latrines and a washing area.” Mililo, 14 years old. “We are thankful that we could play in this bouncy castle. We had a lot of fun together.” Mary, 4 years old. "Since now we have learned about good hygiene practices, we need to go and tell others," says Evelyn. The community and Hamuandu ADP hold meetings with children so they will learn how to take care of water sources. Evelyn is demonstrating to children at a local well how to practice good hygiene during a water and sanitation meeting in her community. The children learn how to take care of their water source and the importance of clean water to help prevent diseases. Melody aged 13 says: “There is a great improvement in our performance by learning using television, an innovation introduced by World Vision, in partnership with the government, which makes learning in a fun and creative ways”. The television programmes focuses on the sanitation and hygiene needs. Mwiinde, age 6 says: “The new water system has led to reduced distances and provision of clean water, and added, saving my mother many long trips as the water is closer to home and water related diseases have reduced." “Dorcas, aged 11, demonstrating how to use a tip tap which the school has put up through World Vision intervention. Dorcas says, “I am grateful for the improvements in hygiene and sanitation at my school as well as sensitization on good personal hygiene at both individual and household levels”. Milimo, aged 10, grade 2, attending general medical screening facilitated by World Vision. Milimo says, “it is good to undergo general screening so that one is treated for illnesses such as blood pressure, diabetes and bilharzia (parasite) as it will help keep children healthy in the community”. “I have been given a blanket through World Vision programmes which will keep me warm and report to school on time. Even my friends have also been given blankets. We no longer share one blanket with the four of us siblings” says Busiku, a grade five pupil, aged 13. Crynes, aged 12, of Hajuunza Village of Hamaundu Area Development Program, could not hide her joy after returning from school. She found that World Vision had commissioned a newly drilled borehole in her Village. When asked about how she feels about having clean and safe water in her village, she had this to say,”I am very happy." Ndesha Siamalowe, aged 61, at the new borehole in Hajunza village of Hamaundu ADP. Ndesha Siamalowe, aged 61, pumping water from a newly drilled borehole. "My children and I will no longer walk long distances to draw dirty water. They will no longer go to school late because of having to draw water before they go to school. Thank you World Vision for your wonderful works of bringing water." “Walking long distances to fetch unclean water, feeling very tired and missing classes in school is a thing of the past as we now have a borehole near our village which provides us with clean water” smiles Mutinta 7 years old with bucket of water on her head. I no longer have to fear of diarrhea diseases at my school after using the run down toilet facilities, thanks to World Vision for the new 24 Ventilated Improved latrines built at the school says Chipo 8 years old doing his grade one . “I am able to read and write thanks to World Vision for the books that we received says Bulongo, 8years doing his grade 2. “The Teacher will release the books during reading time and we will learn new words”. Richmond 43, in a white shirt says we will no longer have people especially the young ones dying in transit to the district Hospital as very soon we will have our own new health Centre and qualified staff working here in our community to attend to sick patients. World Vision brings clean water to the Simuyaba Village of Hamaundu ADP. Mr. Hamujase (wearing a grey shirt & hat), and his family witness the drilling of the new borehole. Rebecca Malawa, aged 75, (left) and Jessie, aged 85, (right) live in the Bulanda-Michelo village of Hamaundu ADP, in Zambia watch the drilling of a borehole in their village. 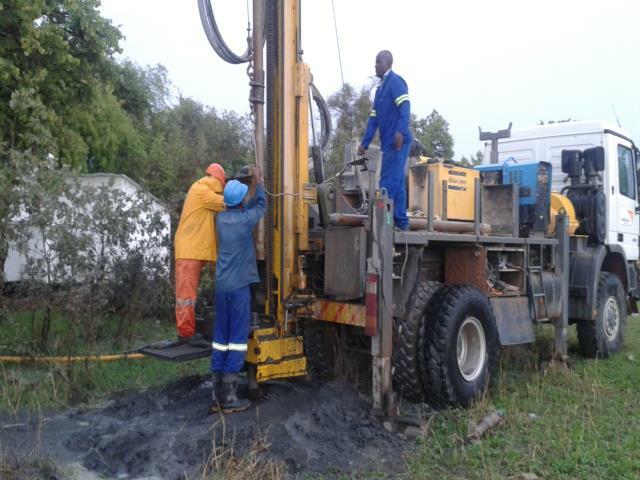 This is the drilling team working on a borehole at the Kanchomba Clinic. The clinic saves a population of over 3000 people. "We thank God that we have managed to get water. We have been drilling unsuccessful wells or dry wells," said Mushukwa, a driller. "We are happy that the clinic will have water now." Children, especially boys, love playing soccer. It keeps them away from drugs, alcohol, and sexual activity. The children make a ball from plastic and kick it around with their friends. Children play Ring, Ring and Roses. The young children love this game and will hold hands and move in circles. They play at church during Sunday School. 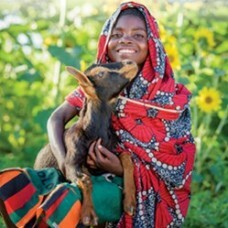 Our Goats do not die or suffer from diseases and are able to multiply, thanks to World Vision for the training me in livestock management says Munjeba 11year old, in dark blue t-shirt. “I can sleep comfortably in warm blankets, thanks to World Vision for this wonderful Gift of a blanket”. What a good Birth day gift,” says 5 year old Mike. “We now have reading books for our classes laments Agness, 8yrs sitting fourth from right.”World Vision has really come to our aid by the donation of good books with pictures for easy learning”. Youth live in villages that respect their rights better. Child protection workshops equipped 35 leaders to raise awareness about child rights, such as using positive discipline. More youth are advocating for their rights. Altogether, 76 children have formed 4 child protection clubs to stand up against child abuse. Girls and boys have better sanitation practices to be healthy. Through hygiene training, 2,408 children now have hand-washing facilities at home. Babies are healthier because their mothers are educated. After being trained, 74 health volunteers taught 362 pregnant women and mothers about nutrition and breastfeeding. Students' learning conditions are improving. Schools received 140 new desks, ensuring that 420 pupils can enjoy studying in comfortable classrooms. Children can thrive in schools with more learning resources. New computers are helping 457 students have improved computer literacy skills. Children have more trained leaders to teach them about their faith. Mentorship programs encouraged 42 students to choose peers who motivate them to be better people and become influential members of society. This activity was in partnership with faith leaders who taught children to seek God first. Agriculture fuels the economy in this community, but poor harvests have left many families without a sustainable source of food and income. Low crop production is a result of the use of outdated tools and techniques, a lack of irrigation systems, and unpredictable weather patterns. Farmers could benefit from loans to boost their businesses, but most of them do not have collateral required by lending institutions and also cannot afford high interest rates. And without access to reliable markets, farmers rarely receive a fair price for the little food that they produce. Parents understand the importance of their children’s education, but schools in this community offer limited opportunities for children to thrive. In most cases, schools lack furniture and learning supplies, and are understaffed. The buildings are in poor condition and have too few classrooms to accommodate all the students. Dropout rates are fairly low and are typically attributed to early marriage or difficulties traveling to school, especially during the rainy season when students have to wade through streams to get to class. Water in this community comes from boreholes, rivers, dams, and shallow wells—most of which are seasonal and unprotected. Without clean water or proper sanitation and hygiene—as well as knowledge about these topics—children are vulnerable to easily preventable diseases. Another significant health issue is the AIDS pandemic, which has robbed children of their parents and isolated families. Health clinics are not easily accessible, and often are understaffed and short of drugs, medical supplies, and proper equipment. Diseases that could easily be cured or prevented end up leading to death because of poor healthcare services. Your gift in any amount will provide help and hope to struggling families in Hamaundu, Zambia. WorldVision is working alongside people in this community to develop tools and resources needed to help them build a better world for their children. Your gift will allow them to accelerate important projects aimed at meeting their critical needs. Together with the support of our generous sponsors, your gift will help this community become a place where children can grow and thrive. – Our continued partnerships with the government and churches. – God's provision and protection for the refugees who have come to Northern Zambia. World Vision has been in this community for 9 years.